In 2008, Friedman received an honorary Ph.D from the University of Belgrade. He is an honorary professor at the University of Belgrade's Faculty of Physics and the Faculty's world-famous institutes: Institute of Physics, Institute of Physics, Zemun and Vinca Nuclear Institute. In 2003 he was one of 22 Nobel Laureates who signed the Humanist Manifesto. He is an atheist. ↑ Nobel Prize winners: Supplement, 1987-1991 : an H.W. Wilson biographical dictionary, Volume 2. Google Books. H.W. Wilson Co. 1992. Retrieved June 3, 2014. 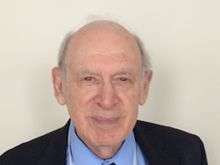 ↑ "Jewish Laureates of Nobel Prize in Physics". Jewish Laureates of Nobel Prize in Physics. Israel Science and Technology Homepage. 2013. Retrieved June 3, 2014. ↑ "Board of Sponsors". Board of Sponsors. Bulletin of Atomic Scientists. 2014. Retrieved June 4, 2014. ↑ "Faculty of Physics". University of Belgrade. 2014. Retrieved June 3, 2014. 1 2 "Institute of Physics Belgrade". University of Belgrade. 2014. Retrieved June 3, 2014. ↑ "Vinca Institute of Nuclear Sciences". University of Belgrade. Retrieved June 4, 2014. Wikimedia Commons has media related to Jerome Isaac Friedman.